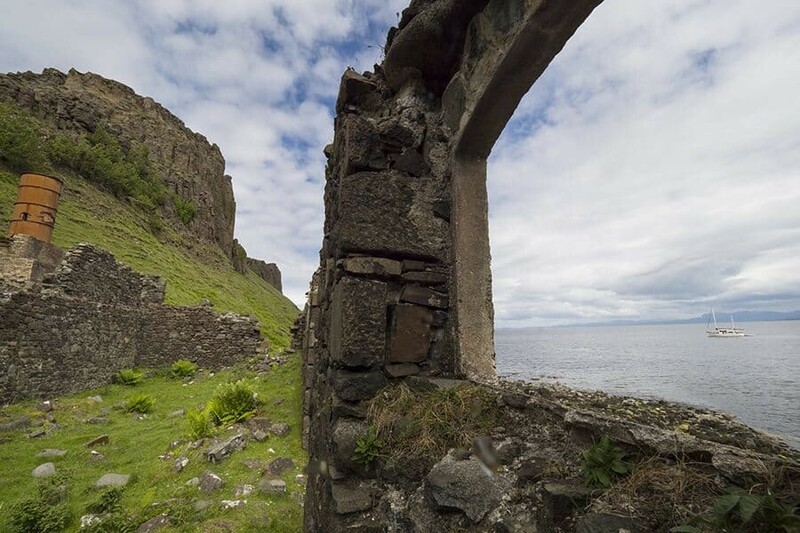 Isle of Skye Photography Locations - Where to Take Photos Isle of Skye? A little like crossing to Jurassic Park, the Isle of Skye appears like a land of mystery, intrigue and complete natural beauty. 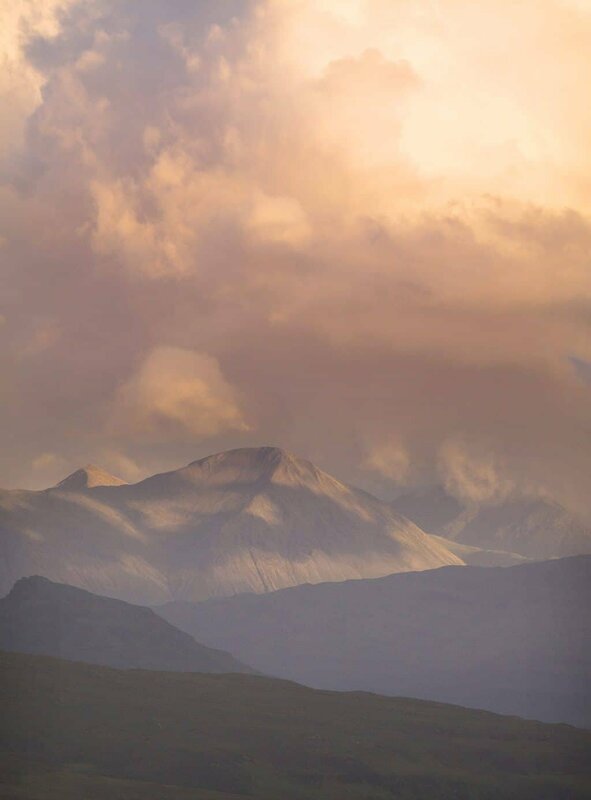 Whether you’re arriving by ferry or over the bridge, with rugged peaks in the distance and a vast emptiness in most directions, Skye has the wow factor. You’ll want your camera handy for every single moment here, even if things get a little misty and moody! 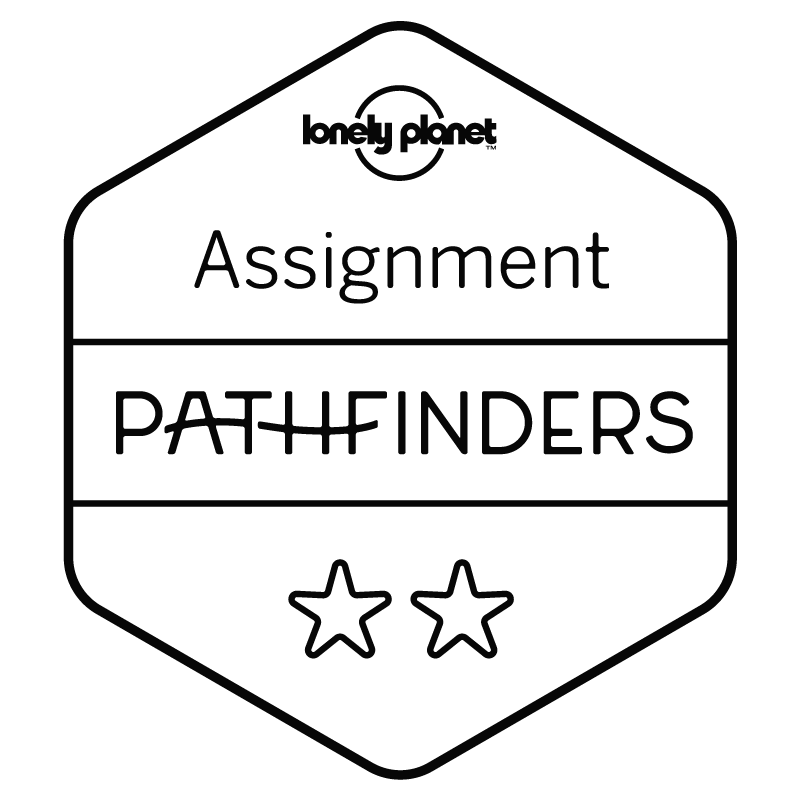 I won’t ramble on anymore because I know if you’ve found this guide you’re probably either about to visit, or are currently travelling in Scotland. I’m sure you just want to know where to go and when! As always, below is a map revealing where all the great photography locations are on the Isle of Skye then afterwards are the descriptions of each location and sample imagery I’ve taken on my visit. I was going to write that this was my favourite place to photograph but you know what? It’s all good on the Isle of Skye. 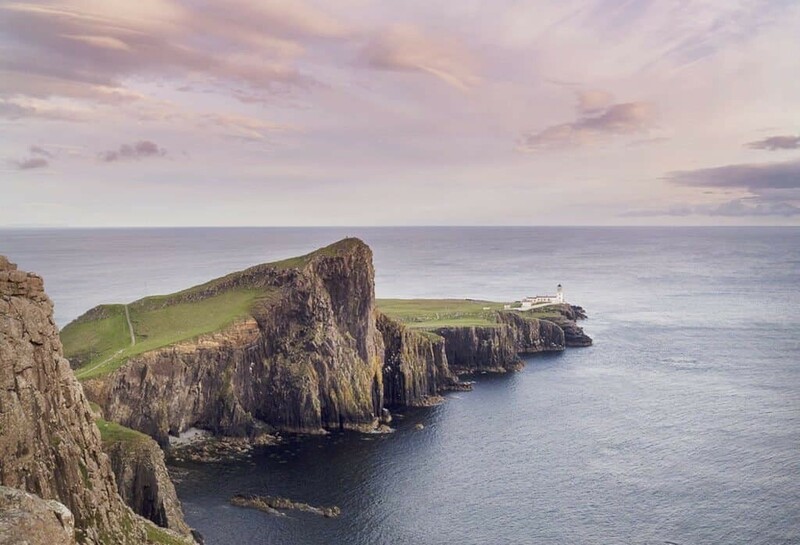 Neist Point offers dramatic coastal scenery with cliffs dropping into the ocean, swooping seabirds and one very photogenic lighthouse. You’ve no doubt seen this spot on Instagram at some stage, it’s super popular at sunset but as with all of the locations around Skye, the landscapes are so large it’s easy to feel like there’s no one around. Upon arrival a good dollop of salty air will hit you in the face and from then on you’ll find it impossible to not to wander and capture a variety of perspectives. 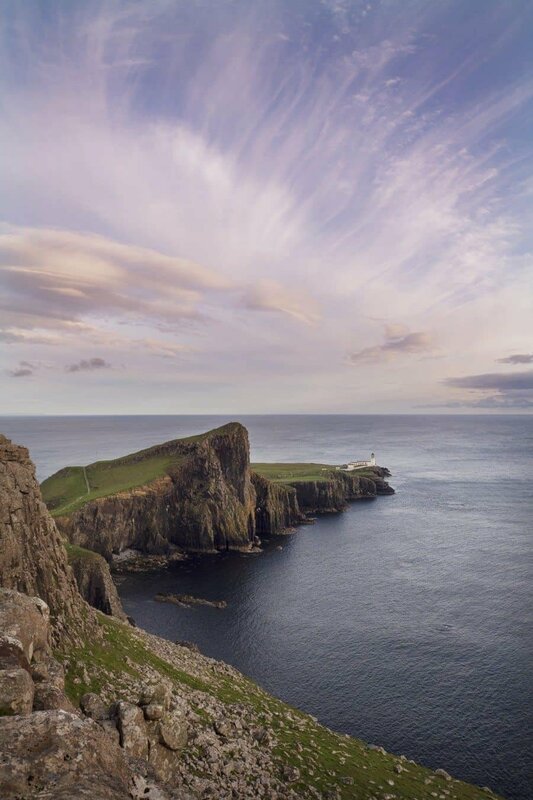 Be sure to get to Neist Point early in the afternoon to give yourself enough time to explore it from all angles. Wander down the hill to the lighthouse then a great place to capture sunset is from the top of the cliffs looking over the lighthouse below. Getting Here: From Portree head towards Dunvegan then take Mill Road which cuts across past Kinloch Campsite towards the B884. Stay on that road and simply follow the signs to Neist Point Lighthouse. It takes a good 30 minutes or more and most of the road is single lane so keep an eye out for sheep and campervans! Photo Tip: Get away from the crowds and find your own unique perspective. There will no doubt be a cluster of tripods getting ‘the’ shot of Neist Point but if you wander along the headland a little there’ll still be a very similar shot and you can sit on the giant boulders and enjoy the moment. Lush crags poking up amongst atmospheric scenery that conjures all the feelings of remote beauty. 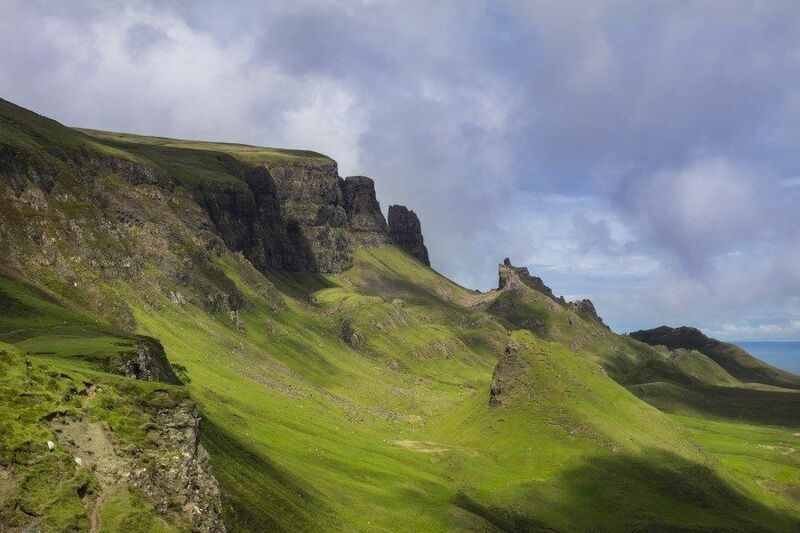 Quiraing is stunning, you could really use all the adjective in the dictionary to describe it. Driving up from the coast road towards it gently eases you into its beauty however the views from the top and along the walking track are second to none. One thing to note which I think is really essential is that it’s very crowded in peak season. We visited just after lunch one day and found it almost impossible to stop the car because there was no patch of grass left for almost a full mile after the parking lot and coach loads of tourists were piling along the walking track. That said, arrive for sunrise or off-season and I’m sure you’ll experience the true magic Quiraing offers in completely different circumstances. Even with the crowds though, the landscape is so vast that it’s easy to block everyone out and just stare in total awe of the beauty. 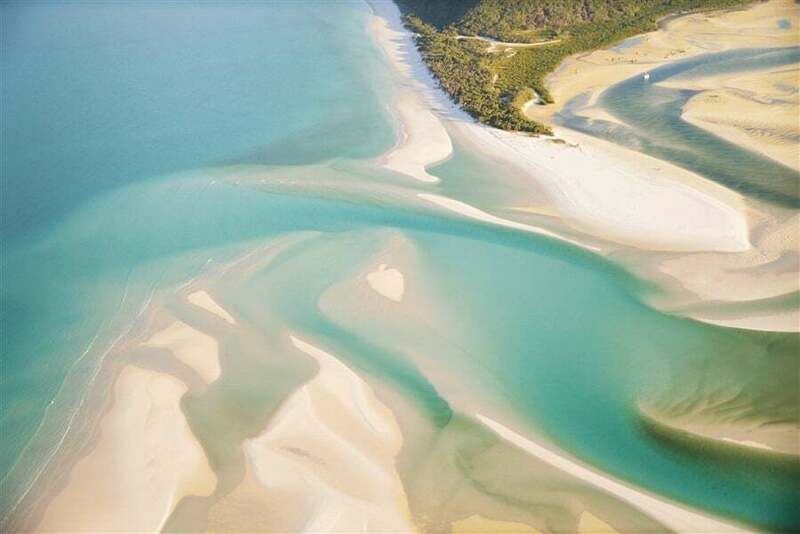 That such a place this perfectly formed exists is astounding. 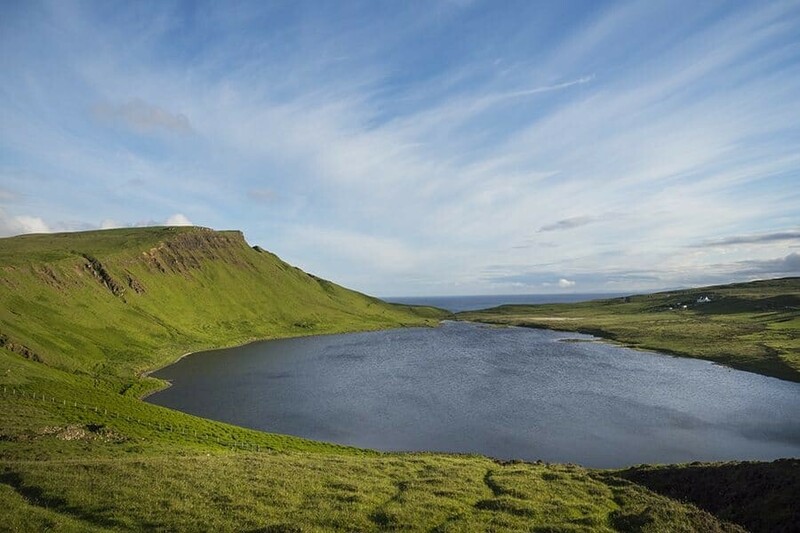 Without stopping the Quiraing hiking route takes roughly two hours to complete, but for photographers he 6.8km loop trail will no doubt take much longer. There’s three main rock formations to keep an eye out for, the Prison, Needle and Table. 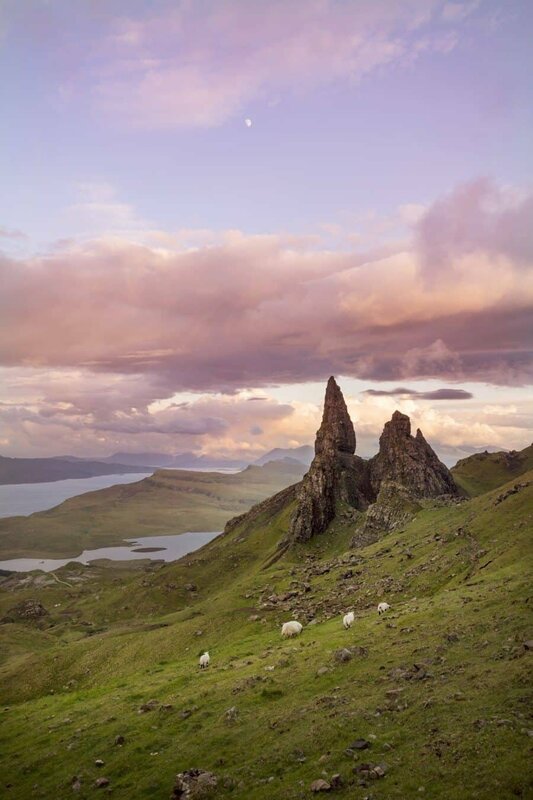 Getting Here: Located in the north of the Isle of Skye it’s a great spot to include when you’re exploring the Trotternish area with stand outs like the Old Man of Storr. Photo Tip: There’s so much to capture here and to really make your images pop, plan your trip for sunrise or sunset to experience the mood and watch the landscapes in the changing light. Like a trail of glowing fairy dust weaving down the River Brittle, the Fairy Pools are something special. You’ll find these gems (they actually sparkle in sunlight!) near Glenbrittle almost in the very centre of Skye. Great as a place to stop either on your way up to the northern regions, or on your way back across to the main they can get busy so try to arrive early or late in the day. If you’re looking for a place to test out your long exposure photography, this is it. With so many waterfalls all varying in size, strength and surroundings, the Fairy Pools are a water lovers dream. Located within a giant valley, the mountain landscapes around offer a number of great possibilities for composing your shot, it’s then just a matter of decided which pool and where to climb down. The walk takes roughly 20-30minutes to get to the furthest set of falls so don’t just stop at the start, keep exploring until there’s no more to see. Also I found the further you wander, the better they looked and also be sure to try different vantage points. Getting Here: Take the A863 at the Sligachan Hotel (who are happy to provide a printout map to the Fairy Pools for anyone lost and without phone signal). Once on the A863 continue until the B8009 appears on the left then follow that until you see a sign to the Fairy Pools, again on the left. After that turn it’s a short drive up and over the hill past paddocks until the valley appears before you. There’s a car park or you’ll also find people tend to park along the edge of the road too. Photo Tip: Don’t be afraid to get in and get up close to the falls! They’re not the warmest but they are so clear and on a sunny day the blue tones are striking! Standing tall with a rugged appearance high above the lochs and landscapes of Skye, The Storr is the most popular place for photographers on the island. 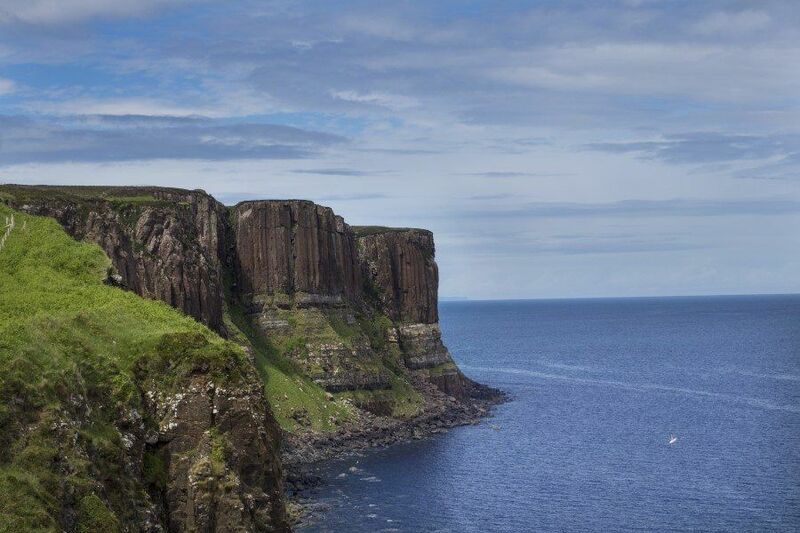 Formed originally by a landslide, the jagged rocky sections jut out from the Trotternish Ridge. Take a peek at my more extensive post about ‘Hiking the Old Man of Storr’ which also lists a number of different vantage points to photograph this stunning scene. 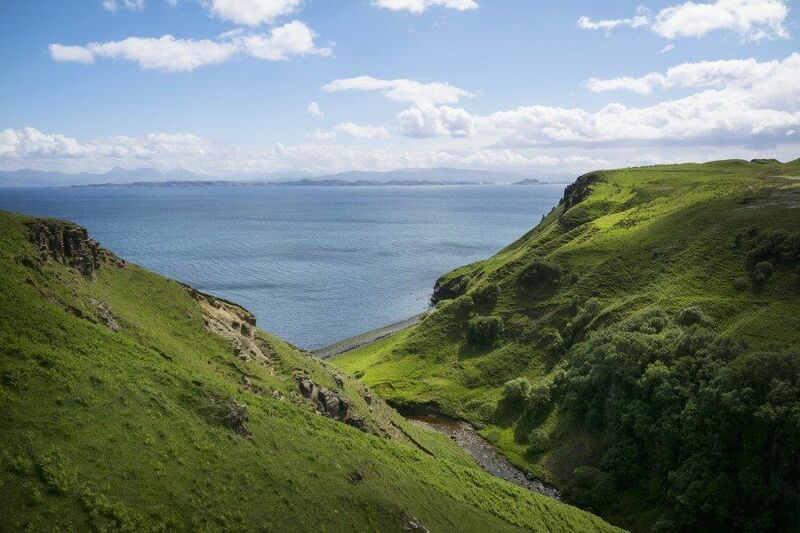 Make this one of your must-see landscapes while on the Isle of Skye. Also be sure to arrive either early in the morning or late in the evening to ensure you avoid the crowds. Getting Here: You’ll find the carpark to begin the hike up to the Old Man of Storr on the A855, about 7 miles from Portree. Photo Tip: Arrive for sunset and stay to photograph dusk, or alternatively get there early for sunrise if you’re really keen! Avoiding the crowds will result in beautiful people free images and the sheep will appear in greater numbers too. When driving towards Dunvegan or Neist Point you’ll see two flat top mountains in the distance. These are the Macleods Tables and for some reason, I loved them! They may be named after my ancestors however their form is so unique to most of the landscapes around the Isle of Skye that it makes them a refreshing subject to photograph. You can capture them from across eastern side of Loch Dunvegan or on the drive towards Neist Point there’s a few vantage points to keep an eye out for. 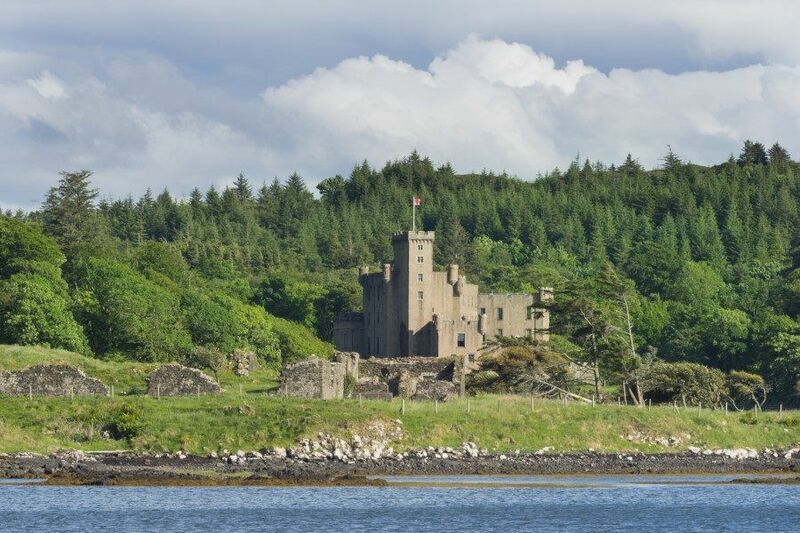 Home to seat of the Clan MacLeod, Dunvegan Castle has a personal link to my family’s history. Resting on the shores of Loch Dunvegan, the castle sits overlooking an inlet and is a beautiful subject for reflections. 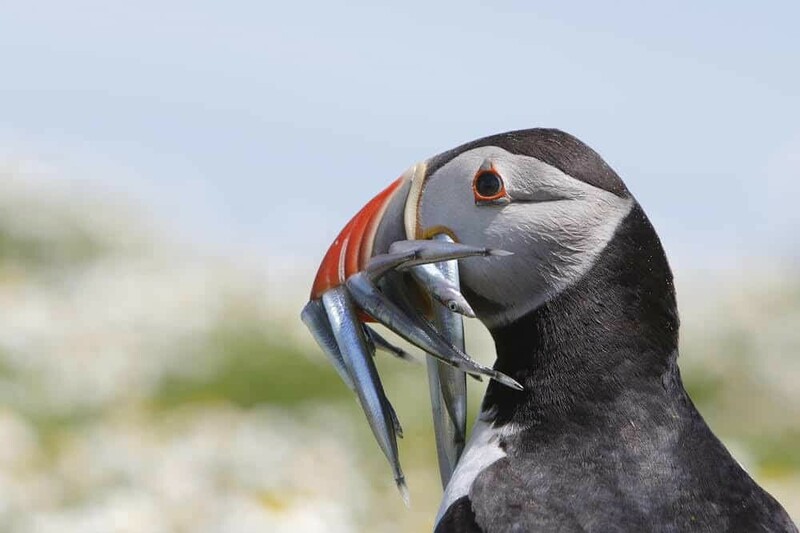 If you manage to arrive before 5pm you can access the castle and its preened gardens for £13 and there’s also the possibility to go seal spotting, fishing and more from the castle. If not, there’s a great little spot to take photographs of the castle across the lake. Continue past the carpark down the one way lane and follow it alongside the loch until you turn back and see the castle. It’s actually a great spot for a picnic and after you’ve taken your shots of the castle you can watch as the seals frolick in the water nearby. Getting Here: From Portree head north then take the A850 all the way to Dunvegan. Once you get to the Dunvegan Hotel, turn right and take the small road until you see a carpark on the right for the castle (which is on the left). You’ll find this beauty beside the A855 on the way to hiking the Old Man of Storr and it’s actually for that reason I’m mentioning it. 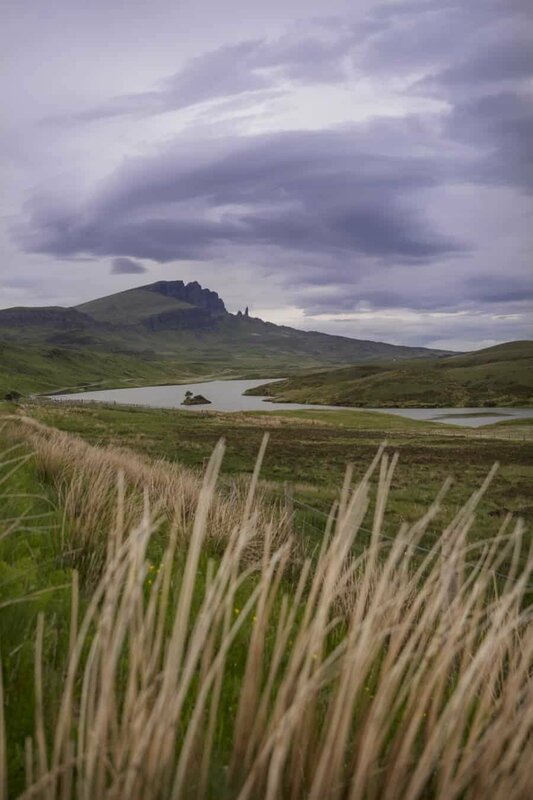 As you arrive from Portree you’ll start to see ‘The Storr’ appearing in the distance with Loch Leathan and the adjoining Loch Fada providing a great place to pull over and capture a different perspective. With the water offering reflection potential in the right conditions, or the reeds in the field and grass offering a softer foreground subject. On the road to Neist Point Loch Mor will reveal its photogenic wonders. After crossing the hill from Milvaig keep an eye out for a small parking spot on the left so you can pull over and capture shots of the landscape. Once the summer greens kick in towards the end of May onwards, there’s a striking contrast of green and blue with the loch overlooked by an impressive ridge. This spot is so beautiful! Wandering from the carpark towards the sea offers a number of vantage points back towards the Lealt Falls (remember to turn around) however for me, it wasn’t the falls that were the drawcard here. Once you get to the viewing platform look down and you’ll see the ruins of an old building, originally used as a Diatomite factory or ‘Caile’ (Gaelic for chalk). Taking the track down the hillside (be careful as it’s steep and slippery) you’ll pass sheep happily munching away on the grass before reaching the ruins. They’re completely overgrown and mysterious! Beside them is a freshwater stream that flows from the Lealt Falls and underwater is the richest green, almost fluro like moss you’ve ever seen. If you’ve got a waterproof camera definitely bring it here to peek underwater and the lush locks of moss. Getting Here: Another great spot along the A855 from Portree to Staffin, it’s about 5-10 minutes from the Old Man of Storr and you’ll find a parking area on the right side just after passing the Lealt Falls House. With vertical basalt columns dropping to the sea, it’s said Kilt Rock resembles of course, a kilt. A popular stop along the photogenic route from Portree to Staffin, Mealt Falls drop from a small loch into the sea and it’s a dramatic scene to capture. Depending on how much rain has fallen prior to your visit, the falls will either be a gentle mist, like during my trip, or they’ll be gushing over the edge. This is one spot I was really hoping to visit and I had left it until the final morning to do so because for some reason at the time, assumed it was close to the Fairy Pools. It’s not, it’s in the other direction. So just as a heads up, if you want to visit Fairy Glen, do so when you’re up in the north of Skye! 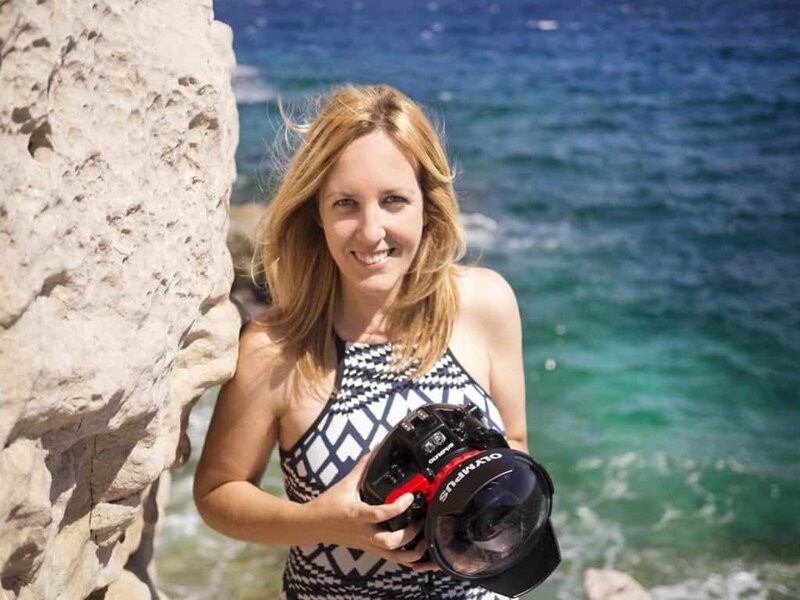 Luckily, my friend and fellow photographer Sarah wrote all about it from her trip so rather than me chat about it, head over to her site The Wanderblogger to take a peek at this incredible place, there’s loads of beautiful photos! A huge part of photographing the Isle of Skye takes place by the road, on foot up in the mountains, paddocks and fields or down by the lochs. Some places aren’t named, they’re simply super photogenic. For that reason I just wanted to include a little part about leaving time for unexpected stops. When driving around the Isle of Skye you will no doubt come across somewhere every mile or so that you want to stop and photograph. There’s sheep wandering over the roads, the scruffy Highland Coos (cows), and endless peaks changing as the light and clouds roll over their rocky tops. 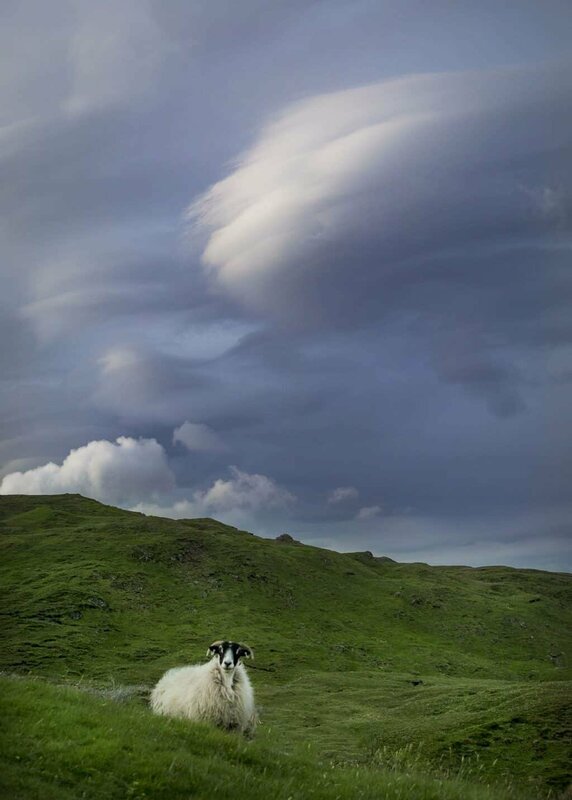 Keep your eyes peeled because the Isle of Skye will be different for everyone at varying times of the year, day and even minute with the weather constantly changing. If you do end up with a wet day on the Isle of Skye, don’t let it deter your adventures because rain does pass and the mist adds to the mood, creating a beautiful atmosphere for photography. The road around the north from Portree to Staffin is a must-do drive. 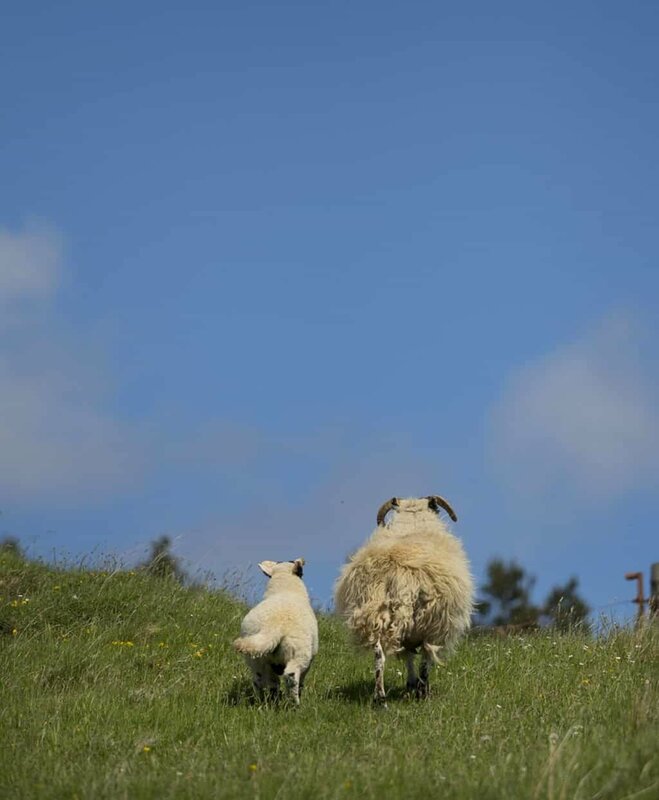 I’ve mentioned it a few times in this guide but taking the full route all the way around to Uig provides the opportunity to see farm houses, stunning coastlines and so many sheep. Really, if you like sheep, this is the place to go! Just a short walk from Claigan, Coral Beach is filled with exactly what you think, coral! 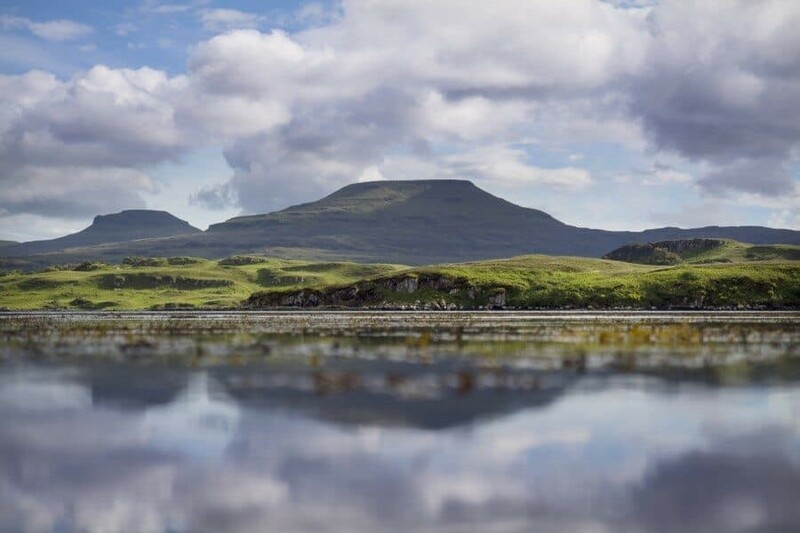 It’s known as one of the most beautiful beaches on the Isle of Skye and because it’s located right at the entrance to Loch Dunvegan there’s also great views across to Camas Ban. Offering views across to the Isle of Skye, Raasay is technically a separate island but, it’s just a short 25minute ferry ride across from Sconser. Much less populated than the Isle of Skye, Raasay offers a rural charm. Check ferry info here. 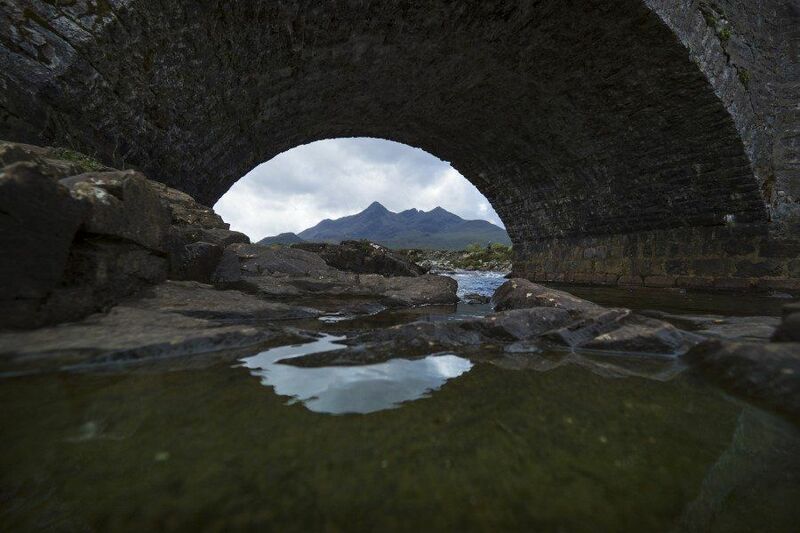 A great vantage point looking towards the Black Cullins Mountain Range, Sligachan Bridge is a great place to stretch your legs if you’ve just arrived to the Isle of Skye. Under the bridge you can find a unique view using the stones as a frame with the mountain peaks peeking through beneath. Access to the Isle of Skye is possible by ferry from Mallaig or you can drive across on a bridge from Kyle of Lochalsh. Whether it’s romantic or just feels a little more adventurous, arriving by sea from Mallaig is a wonderful experience! For all ferry information check the Cal Mac website (full name Caledonian McBryde, how Scottish!). 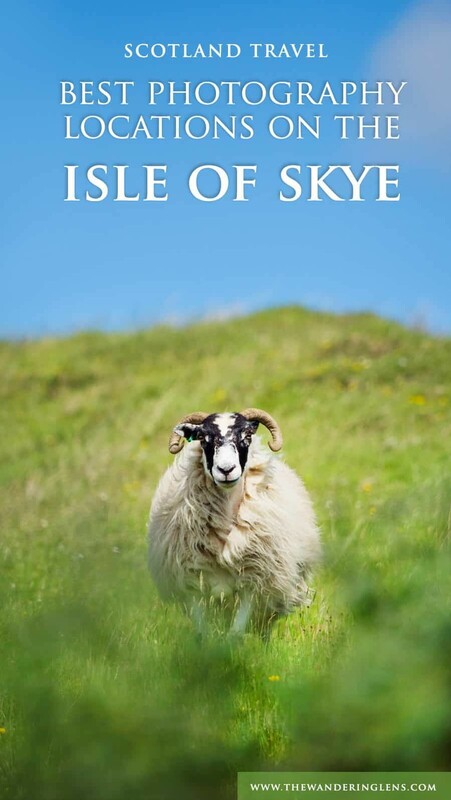 Also if you speak French be sure to read through the amazing guide by my friends Eliza and Max from the Bestjobers, their guide to the Isle of Skye helped immensely in planning our trip and they’ve got incredible photos! From Edinburgh the Isle of Skye is roughly 4.5hrs if you go via the Kyle of Lochlash and take the bridge. If you’re hoping to also see cut across the beautiful Loch Lomond National Park to see Glencoe and the famous ‘Harry Potter Bridge’ at Glenfinnan then it’s better to travel towards Mallaig and take the ferry. Travel time differs depending on your route but from Edinburgh to Mallaig it’s approximately 4hrs without stops. Travelling from Inverness is much shorter and you can also include the beauties of Loch Ness in your itinerary. 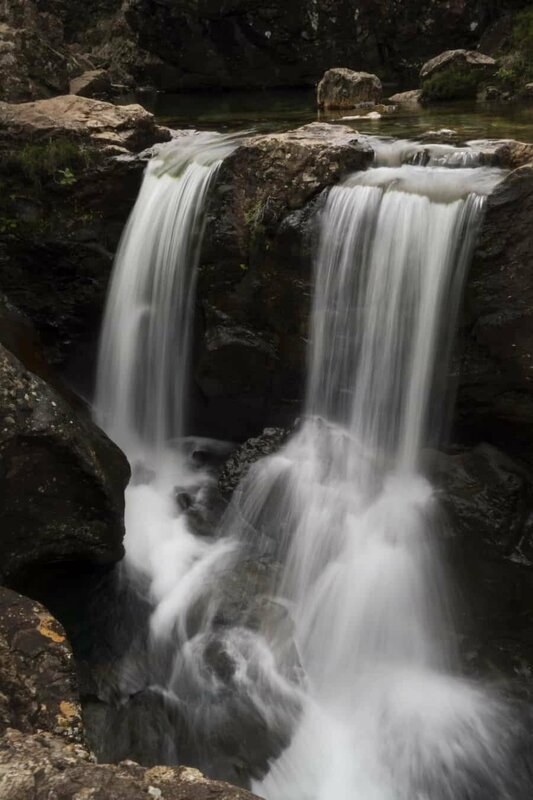 Drive time is just over two hours unless you’re keen to stop and enjoy the ‘Photogenic Locations around Loch Ness’..especially Plodda Falls, they’re a must-see! Where to Stay on the Isle of Skye? 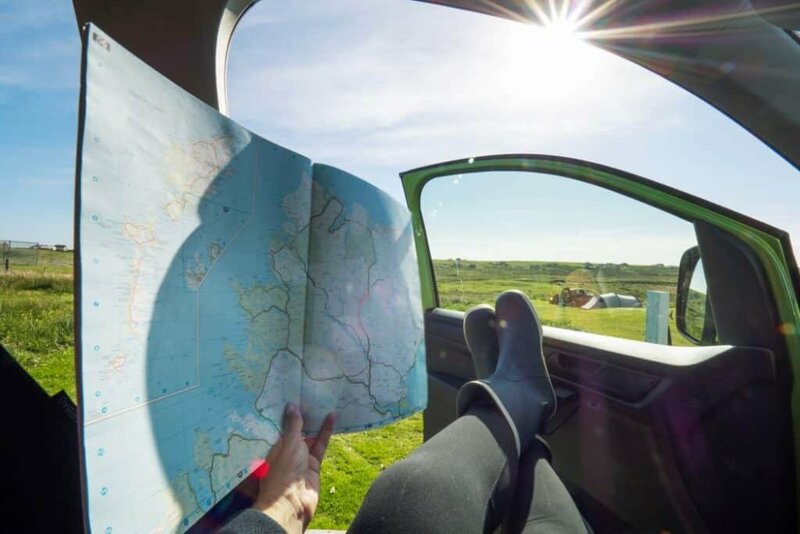 If you’re keen to experience all the outdoors have to offer, travelling in a campervan is a great way to see the Isle of Skye. We ventured around in a Spaceships Rentals van and loved having the ability to pull up wherever and sleep for the night. I do love my comforts though and we opted to stay at the Kinloch Campsite and also Torvaig Caravan and Camp Site, both offering warm showers!! I highly recommend basing yourself in or around Portree when exploring the northern regions, especially if you plan on hiking the Old Man of Storr or Quairaing for sunrise or a late sunset. Portree is the main hub on the Isle of Skye and here you’ll find a supermarket, bakery, cafes, restaurants and boutique stores if you’re keen to do a bit of shopping. It’s a great place to pick up supplies before heading out for a long day of exploring. Alternatively, if you’re after a more rural break, there are a number of guesthouses dotted around the Isle of Skye and even some unique stays like the ones below. Portree Wigwams – they’re super cute and were actually my favourite type of accommodation to stay in. You’ll find this link takes you to the Wigwam site and you can then search for not only the Isle of Skye but Outer Hebrides or further around Scotland. Not sponsored I just love typing Wigwams over and over again. Wigwam. For further information and details on entry prices, tourist attractions and tours, check the Visit Scotland website for more. Have you been to the Isle of Skye? If so, either link to your photos or social media/Instagram account in the comments below or use the hashtag #thewanderinglens. I cannot believe we missed Neist Point when we visited. I even knew about it, but had it on the ‘Only If We Have Extra Time’ list, and there is just never enough time on Skye. The loveliest way to get to Skye is Ivan the Glenelg ferry. Amazing scenery all the way, and take time to see the two broachs in Glenelg. Ferry runs May to September or October, check their website. Community owned, it’s the last turntable ferry in operation. Sorry, that was via the Glenelg Ferry! Also, see the Fairy Hills and stay in Waternish at Mint Croft Bed and Breakfast. Heaven. All of your photos are absolutely breathtaking! Old Man Storr looks like something out of Lord of the Rings! Overall, the Island looks like a photographer’s dream. I would love to go! Your photos look amazing! I’ve never been lucky enough to see Skye in this sort of weather and to be honest always found it a bit too touristy and overrated… Looks like I’ll need to give it another go and make more use of sunsets and sunrises! These are stunning locations. Great photos. This came at the perfect time as we are heading to Skye in 2 weeks! My boyfriend is into photography so I will share this post with him! Your pictures are gorgeous! I can’t wait to go and see all these places myself! I love Isle of Skye! I was really lucky to travel here when I was 11 and have wanted to go back ever since. The map you included is really helpful (I’m a visual/spacial person). The places you showcased and your photographs of them are gorgeous! 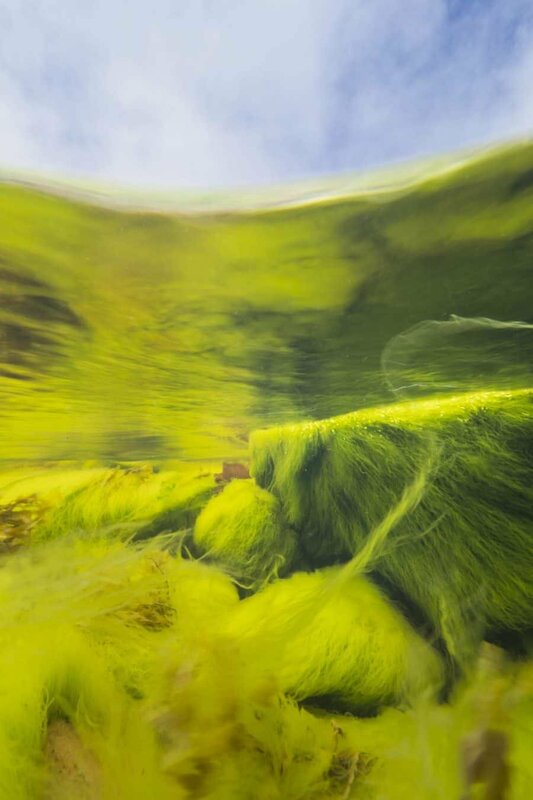 I especially like your underwater photo of the moss (such a unique photo!). This is the type of guide I look for when traveling. Thank your for the thorough and beautiful post! My favorite picture is the one of the two little goats from behind! So cute! I almost feel like with the Isle of Skye there are more photogenic places than ones that aren’t! 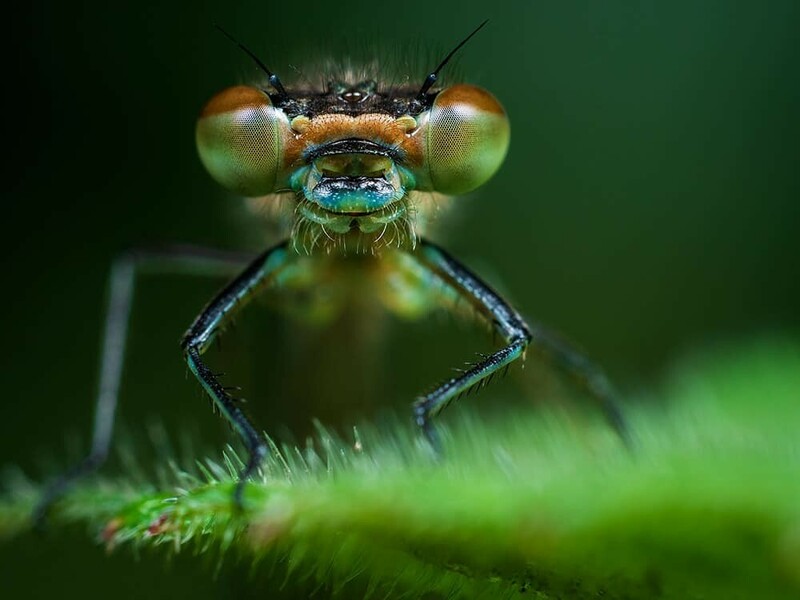 Great, comprehensive post for nature photo lovers! So happy to come across your post. It Will really help me to prepareren my photography trip next year. Thank you very much for sharing the info and showingen your amazing pictures. Great to hear Sander! What time of year are you thinking of visiting? Thanks Jimmy! Are you heading there soon? There’s lots of incorrect information in your guide. Firstly, the Quiraing and Storr do not work at sunset as they are both east facing and therefore in shade. You have incorrectly named Loch Fada as Loch Leathan. You seem to have visited every location in the middle of the day, which is the worst time to go anywhere on Skye for photography. You’ve also missed out some of the best locations and included some which aren’t very good. Thanks for your message Marcus, I appreciate the tips however do realise that Quiraing and Storr face east but find that the sunset and dusk light in particular still work beautifully for photos. As in other guides I’ve written I’ve mentioned I’m a big fan of the anti-sunset, facing east when the sun is setting in the west in order to capture the changing light across the landscape without direct sunlight. Most visitors to the area don’t have weeks to spend only photographing sunrise or sunset in each location hence the inclusion of some daylight imagery, also, I’m writing not just for landscape photographers with filters and tripods but for people who love taking photos in general. 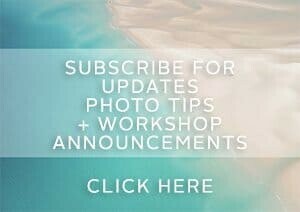 I would have been happy to include some tips from a local photographer such as yourself had you approached me via email. Enjoy the summer months and warm light! Just a quick thanks for all your various postings related to Scotland. I’ve just returned from 12 days there and visited many of the locations you detailed. Cheers!